West Ham United's Jose Fonte (£5.3m) and Cheikhou Kouyaté (£5.0m) both claimed three Fantasy Premier League bonus points in the 0-0 draw at Stoke City. Fonte played a pivotal role in helping the Hammers to a third clean sheet in four Gameweeks, contributing 16 clearances, blocks and interceptions (CBI) to score 33 in the Bonus Points System (BPS). Kouyate matched that tally from central midfield, with eight CBIs and 12 recoveries, while also winning eight tackles, the most in Gameweek 35 so far. Stoke City's Bruno Martins Indi (£4.9m) collected the final bonus point, scoring 31 in the BPS after eight CBIs, six recoveries and two tackles won. While defences dominated at the bet365 Stadium, two playmakers, Manuel Lanzini (£6.0m) of West Ham and Stoke City's Xherdan Shaqiri (£6.0m), still ranked highly in the ICT Index. Lanzini top-scored with 10.5 thanks to three shots, of which two were on target, while also creating two chances. Shaqiri scored 10.2 after five shots on goal, with two from inside the West Ham box, as well as three key passes. Marko Arnautovic (£7.1m) led for Creativity in the Index with 52, scoring 8.8 overall. The Austrian provided two successful crosses and four scoring chances. A first Stoke clean sheet since Gameweek 27 coincided with Jack Butland's (£4.5m) home debut this season. The goalkeeper retained his starting role, having ousted Lee Grant (£4.4m) in the 2-0 defeat at Swansea City last weekend, and made four saves on Saturday. FPL sales of Grant have since accelerated. He is the most sold goalkeeper, moved on by more than 45,000 managers over the last three Gameweeks.  Mark Hughes reacts to this afternoon's @premierleague draw with @WestHamUtd at the bet365 Stadium. 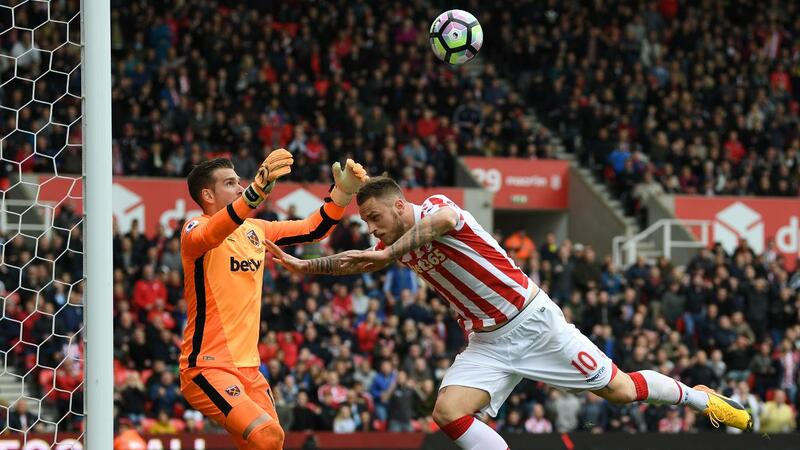 Arnautovic was a popular target in the Stoke ranks before the weekend, attracting more than 11,000 new owners anticipating a repeat of his 12-point return from the previous home outing, against Hull City. The Austrian will likely make way for the season run-in, with Stoke one of 10 sides without a Double Gameweek. West Ham also fall into that camp and offer little to attract FPL investment with Tottenham Hotspur and Liverpool their next two opponents.